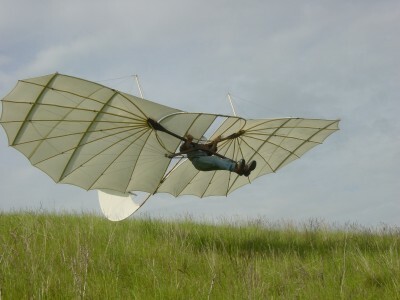 During his lifetime Stephan Nitsch has made some amazing gliders. 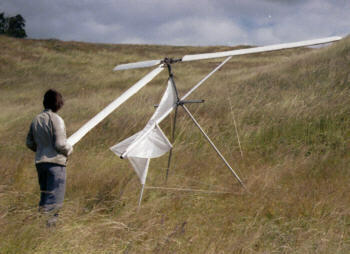 His most comprehensive work was making replica's of Otto Lillienthal's and Cahnute gliders. What got me on his trail was something completely different. 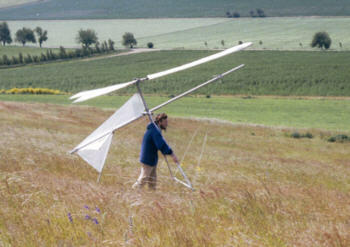 Years and years ago I saw a small picture of a gyro glider in "Drachenflieger" now called "Thermik". This small picture I could not find again, so also the name Stephan Nitsch was unknown. Surfing the internet extensively resulted in me finding the Stephan Nitsch website . Soon I contacted him and we exchanged some flying information. It is a pity that Stephan died, but luckily his website still exists and I would like to share him with you. Images below speak for themselves, but lets speculate a bit about the gyro. 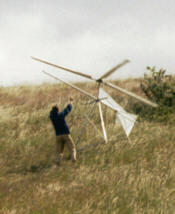 From the video on the website you can see he had some rotational stability problems, also gyro's are not known for their great glide ratio. 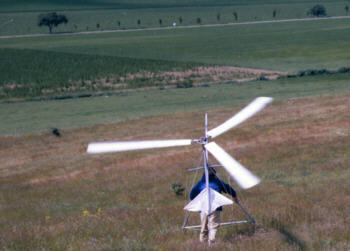 How about keeping the gyro into the apparent wind / direction of flight. 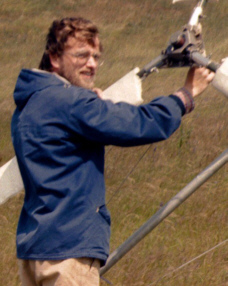 The vanes, of vertical planes on the gyro seem small. The wind speed required for sufficient rotational speed for lift off seems to be quite high. He had to do it with materials from behind the iron curtain as he was living and experimenting in east germany. But, he made one and started experimenting! What would be possible with modern light weight materials and engineering? Who picks up the gauntlett .